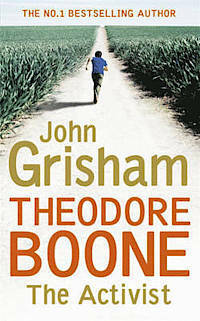 Presenting Theodore Boone #4 The Activist by John Grisham. Though he's only thirteen, Theodore Boone has spent more time in the courtroom than almost anywhere else, and there's always a new adventure waiting. After having been falsely accused of vandalism and theft, Theo is happy to finally be out of the hot seat, once more dispensing legal advice to friends and community members, when an exciting new case demands his urgent attention. This is my first John Grisham book..... Sadly that's true I have to catch up with a lot of good books and authors in the markets...... But this is also the fourth book in the YA Theodore Boone series. Thank God! All the books don't need to be read as series. I'm still not sure what I feel about this series since this is the fourth book but i'd say this though. I liked the straightforward and simply way the story is told and the characters playing their parts. Theo as well written as the protagonist and keeping him well within the constrains of his age and not making him a hi-fi genius. Grisham keeps the tone of the plot simple as it is targeted to the young audience putting in well explained examples to educate us about the role of an activist. While I must say, Law is one subject that had always rushed over my head when we had it on one of my semesters at college (it was mandatory to the course). Still the subject of "Eminent Domain" and the "Animal Court" play a major part in this book. I'm still not sure what I feel for this book since Grisham is known for his adult court room thrillers even more but the Theodore Boone series is definitely well made for the younger audience with concrete examples to educate them (as I mentioned above). There is a well placed satire in this against government - because as one of the characters rightly say, they may be big, rich, powerful and strong enough but it is not in their right to take land from the citizens..... Well Done!! "Theodore Boone, the Kid Lawyer saves the day"